As I was adding some pictures to one of my Pinterest boards ,I came across the above photograph, Of course I just had to look into it to find out who they both were. They were Bertie (Ethelbert White) and his wife Betty ( Elizabeth Crofton-Dodwell ). Ethelbert White (1891-1972) was an artist, poster painter, wood engraver and illustrator and had attended St John's Wood Art School. I haven't found out very much about Betty except that she played the Lute. 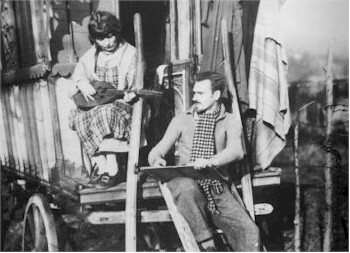 They collected folk songs while they travelled both abroad and in this country, with an 18th century cottage as one of their bases in Hampstead Grove, Campden. I've looked up this street on google maps, it might have been poor at one stage but it's a lovely tiny tree lined street, If I had to live in London then I wouldn't mind it one jot! This area actually has an interesting history. A philanthropist called Mrs Barnett bought a large farm and wanted to turn it into parks for everyone and an area of housing for everyone. She formed the Hampstead Tennant's association . She wanted the poor to live with more 'fortunate beings'. Sir Edward Lutyens was commissioned to design some of the buildings but he wasn't very complimentary of some of Mrs Barnetts ideas saying ' She was a nice woman, but proud of being a philistine-has no idea beyond a window box full of geraniums, calceolarias and lobelias over which you can see a goose on the green' oops sounds like me, I have the geraniums on every windowsill and used to have geese! She sounded like a very good hearted woman that probably didn't really understand the true realities of life but still wanted to make life better for the poor. In her honour I'm definitely getting some calceolarias this year! Bertie and Betty may have known her, because Mrs Barnett died in 1936 when Bertie would have been in his forties. They also had a country Idyll ,another cottage in Amberley in Sussex......I'm just getting a little green eyed. They obviously had money but at least they chose a relatively simple way of life. They were married for over fifty years, singing ,playing music and travelling. They had few possessions but were wealthy enough in later life to have their food delivered to them from Harrods. There are quite a few that live a wonderful boho life and have the comfort of having money in the bank. 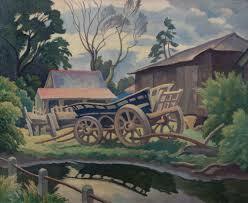 I love the life but have to earn every penny....no fortunes in the bank for me,,,,but that's OK.
Bertie and Betty were regular guests at the studio parties of Augustus John and Sir Alfred Munnings, who also admired the gypsy way of life. I wonder if any travellers went to any of the parties. I would love to have been there, I bet they had a great time. One of Augustus Johns parties to baptise his new studio space in Chelsea, lasted from the first into the second week of July!...Now that's what I call a party.